First I want to thank those who responded with their thoughts on a Vision Forward for the society. Your ideas are critical for the continued success of the Warren S Johnson Society. Since my last report, the Board has met to discuss a statement of mission for the society. (Thanks to Janice Peters for the suggestion.) President Gene Strehlow led those discussions and did the word crafting. He’s very good at that. The Board finalized the Mission Statement at the November meeting. 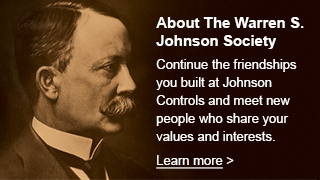 The WSJ Society is a social organization formed to promote the continuation of friendships established during career experience at Johnson Controls through activities such as social gatherings, newsletters, online networks, community service projects, and continued learning experiences. I think this is an excellent statement. We can go forward with this. I hope the description doesn’t look to formal. The idea here is to improve the website with a project that is both fun for the participants and maybe a good learning experience. I’ve been learning about the Lean Startup Process in my work at UWM Lubar School of Business. It involves creating simple statement of business model and how value is to be created for customers. That’s followed by an on-going process to test the model to see what the customers — our members — actually value. We’ll go through the steps, learn together, and apply what we learn to updating WSJSociety.com. Updating the website will be even more fun. WSJSociety.com is based on a popular website creation tool, WordPress with a Buddy Press plugin that provides the social network functions, and a custom theme developed for our use. We’ll be learning about those tools as well as some programming with HTML and CSS where they provide some advantage. We also have Google Analytics to monitor our performance. How about that? Now, if you don’t know what any of those things are, please don’t let that hold you back! I haven’t written code since 1979 when Dennis Miller and I were creating direct digital control prototypes for the JC/80. In the lean startup process that’s called creating a “minimal viable product” to test customer response. We’ll learn what we need as we go along together. And, I expect that there are a few of our members who really know this stuff and might enjoy participating in the project. If neither creating a business model nor getting into the technology is of interest to you, but you would like to contribute, you can! Your insight into member interests and needs or your view of what really makes a website valuable and easy to use will be key to project success as we test and verify in the lean startup process. Finally, besides making this an enjoyable effort, the plan is to engage the team wherever they are. We’ll use email, the cloud, Skype, whatever we can to allow members to participate. You don’t have to be in Milwaukee. Meanwhile I’ll be posting tasks and progress here at “From the Editor” so you all can follow along, maybe even join in if you see something you like.